I liked best the relationships between all the characters. Especially the square dancers and callers. The mystery, like all good mysteries had it’s twist and turns and was paced well enough to keep me turning the pages and wanting more. When her new neighbor Jake Carstairs is murdered in her driveway, square dance caller and accidental sleuth Darla King has a new mystery to solve. This time, it hits close to home. The mystery, and Jake’s wife, follow Darla to the National Square Dance Convention in Nashville. Darla needs to figure out what Jake’s wife and the killer want before Darla faces more trouble than she can handle. As the tension builds, Darla and her friends from Clearton Squares once again contribute to solving a mystery. Her romantic life tangles up with her professional life and her sleuthing, but eventually Darla figures it all out. 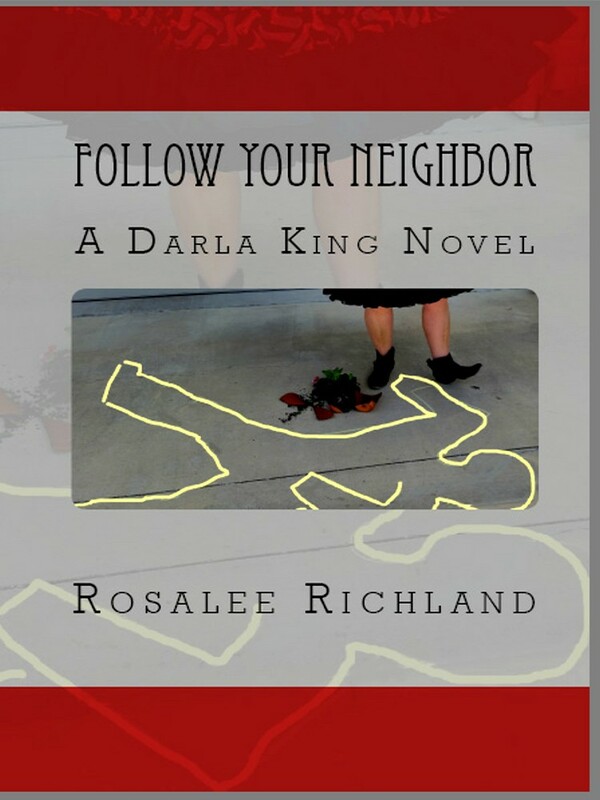 Follow Your Neighbor is the third book in the Darla King mystery series. 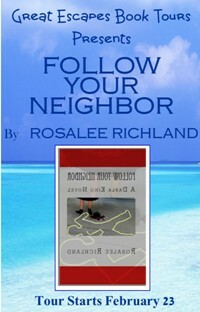 The first book in the series, Right and Left Grand, found Darla and her friends involved in solving a string of burglaries. The second book, Load the Boat, featured a square dance cruise where Darla encountered a dead crew member, a mysterious man with a satchel, and the return of an arrogant yet irresistible FBI agent. Rosalee Richland is the pen name of two square dancers and writers. 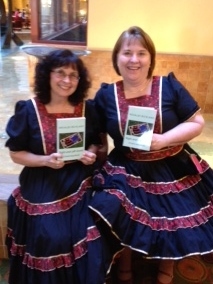 As Rosalee, co-authors Cyndi Riccio and Rhonda Brinkmann joined forces to create the Darla King cozy mystery series. Darla’s curiosity often puts her squarely in the midst of unusual circumstances, and Darla can’t let go until the mystery is solved. Through Darla and her friends, readers are exposed to the warmth and friendship among square dancers, as well as the enjoyment square dancing brings worldwide. When not writing, Darla’s co-authors enjoy reading, traveling, meeting readers and fans, networking with other authors, and – of course – square dancing. The first in the series is RIGHT AND LEFT GRAND and takes place at various locations in Texas. The second in the series is LOAD THE BOAT. As you might guess from the title, this one takes place on a cruise ship.